Size: 2.1" x 3.4" x 0.03"
Within the Datamath Calculator Museum you'll notice a lot of credit card sized calculators like the TI-1754, TI-1780, TI-1786, TI-307, Canon LC-7, Casio LC-79, or Toshiba LC-851. All these calculators have two dimensions common: The length and the width. But we never talked about the third dimension, the height or thickness of the calculators. 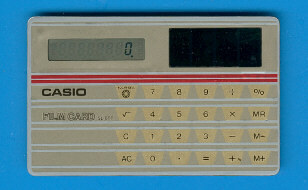 The Casio FILM CARD SL-800 is the only real credit card sized calculator and matches exactly the ISO 7810 standard. This standard is valid for all credit and debit cards and defines a size of 85mm x 54mm x 0.8mm (3.375" x 2.175" x 0.030"). • Be sure not to damage the unit by bending or dropping. For example, do not carry it in your hip pocket. not to excessive pressure the display or push it with a pointed object in order to prevent malfunctions. • Note that the unit has small indentations which are a necessary part of the production process. • Since the unit is composed of precision electronic parts, never attempt to take it apart.